Alison and Pete take customer service seriously and deal with each enquiry individually. You will always be able to discuss your tent requirement with one of us. We will be delighted to hear from anyone with a requirement for a tent, a repair or anything else tent related - we offer a complete service. We make the frame to your requirements and design and manufacture the canvas in the colours you choose, giving you the choice of fire retardant fabric if you need it. All canvas is rot and waterproof so you can buy with confidence. We offer a free 12 month guarantee on workmanship and materials for all tents we manufacture. Delivery is 6 - 8 weeks from date of order. 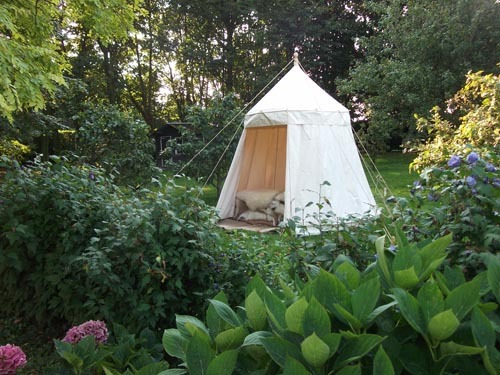 At certain times of year we may be able to get your tent to you sooner - please speak to us. Once you have ordered your tent, you can email us at progress@periodtents.co.uk to get an update on the planned delivery date. Give us a call for a free quote for the tent you need.